This family-friendly Orlando condo resort is located in the entertainment district, within 1 mi (2 km) of Little Lake Bryan and Orlando Vineland Premium Outlets. Discovery Cove and Aquatica are also within 3 mi (5 km). Along with 2 outdoor pools, this smoke-free condo resort has a restaurant and a fitness center. Free WiFi in public areas is provided, as well as free self parking, a free area shuttle, and a free theme park shuttle. Additionally, a bar/lounge, a poolside bar, and a coffee shop/café are onsite. Each condo provides a kitchen with a refrigerator, an oven, a stovetop, and a microwave. For a bit of entertainment, a plasma TV comes with a DVD player, and guests can also appreciate conveniences like a washer/dryer and a living room. 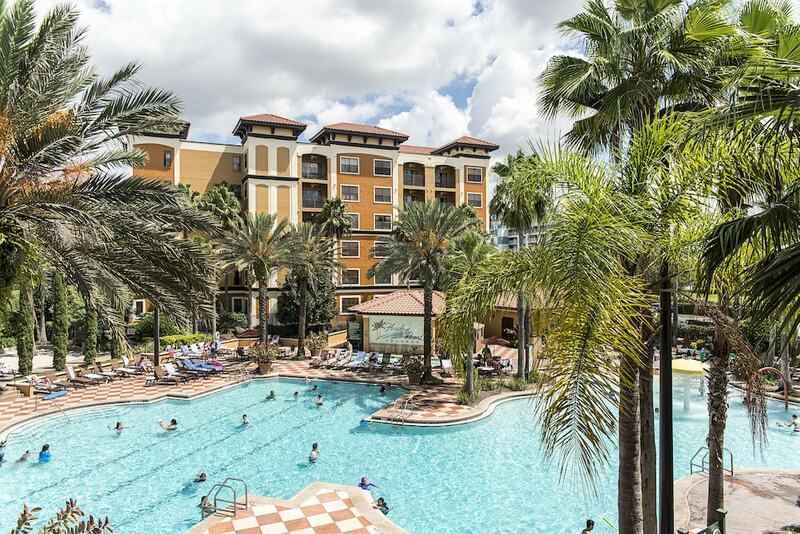 Floridays Resort Orlando features 2 outdoor swimming pools and a fitness center. The condominium resort offers a restaurant, a coffee shop/café, and a snack bar/deli. Guests can unwind with a drink at one of the condominium resort's bars, which include a poolside bar and a bar/lounge. A computer station is located on site and wireless Internet access is complimentary. Business-related amenities at this 3.5-star property consist of a 24-hour business center and a meeting room. Event facilities measuring 2000 square feet (186 square meters) include conference space. This family-friendly condominium resort also offers tour/ticket assistance, an arcade/game room, and multilingual staff. Limited complimentary onsite parking is available on a first-come, first-served basis. Pool Bar and Grill - This poolside restaurant serves lunch only. Guests can enjoy drinks at the bar.